A dark wash with monochromatic stitching gives these these American-made relaxed-fit jeans a high-class look that easily transitions from work to the weekend. Style Name: Citzens Of Humanity Perform - Perfect Relaxed Fit Jeans (Miles). Style Number: 5623632. Available in stores. Do you think you would wear men’s high waisted jeans? Well, why not! 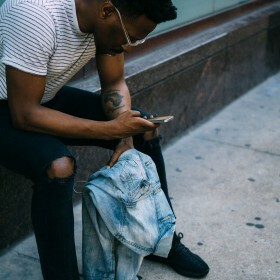 High waisted jeans are seen as a great alternative to men’s skinny jeans, as they maintain a fashionable look but are often found with a wider leg. Wear men’s high waisted jeans with a simple t-shirt (a high-neck top to be especially trendy) and a pair of low Doc boots will complete the look. Insider tip: you shouldn’t be put off by the high waisted style as we think they’re generally more comfortable to wear and if you’re petite or pear shaped, they will also elongate your legs!